Always the highlight of the Lioness Lean In events are the startup stories shared by successful and inspirational women entrepreneurs from the host city, who give personal insights into how they have built their businesses, brands and products over the years. The guest speaker line up included Deyzes Pereira, founder of Startup Consulting, who spoke about her journey to building her business that today helps startups to grow and thrive. Next to share her story was Perola Cuco, a serial entrepreneur and founder of Ecla Services and Cucu’s Lucian Lavandaria. 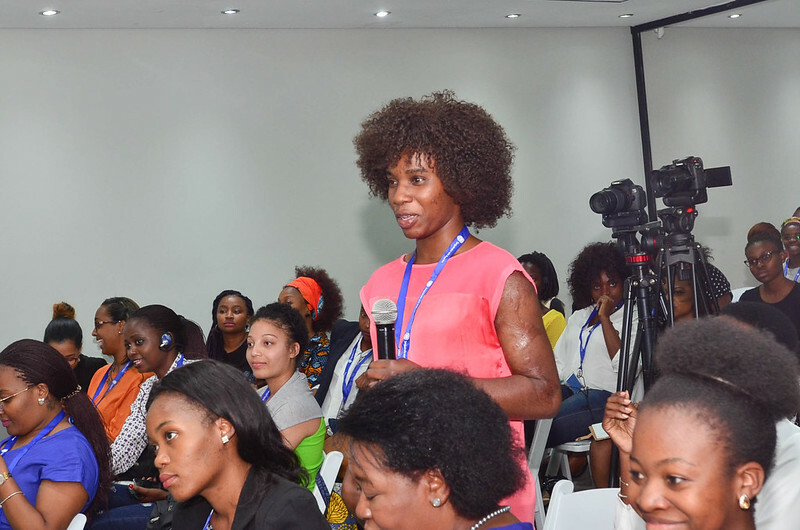 She was a huge hit with the audience as she shared a very personal and emotive story of the challenges she overcame to become an entrepreneur, and her ambitions for the future. The third and final guest speaker for the morning was Patricia Monteiro, founder of children’s luxury clothing brand, Patatufes. She gave a real insight into what it takes to build a boutique retail manufacturing brand in Mozambique, and one that is building a real fan base in the country. The next part of the programme, always a hit with audiences across the African continent, was the Lioness Launch feature. Six women entrepreneurs were selected from the audience to present and pitch their newly launched businesses, products and services in one minute. The pitches were some of the best ones seen this year, and it was a great way of connecting these business owners with potential new buyers and distributors in the audience. Bringing the event to a close, Lionesses of Africa founder and ceo, Melanie Hawken, returned to the podium to share news and updates on some of the latest developments happening at Lionesses of Africa. Highlights included news of the Mozambican businesses who have been nominated to participate in the Lionesses of Africa and Cherie Blair Foundation Global Women’s Mentoring Programme in 2019; news of forthcoming events around the African continent to close out the Lioness Lean In year; and a call to action for attendees to join the community and take advantage of all the support and resources available from the Lionesses of Africa community.The event ended in the usual way with a prize draw featuring gifts donated by the women entrepreneurs exhibiting and speaking at the event and some speed networking over refreshments.